Brazil is globally recognised for its large exports of soy, corn and cotton. However, a lesser known industry that is slowly emerging as a strong investment opportunity is the textile sector. Brazil is geographically huge and diverse, allow the region to produce an impressive variety of natural yarns, fabrics and materials as well as having an emerging retail and fashion market. As well as using cotton, Brazil has begun integrating synthetic fibres and yarns into its production process. However, the expansion in producing these new raw materials, however, is stemmed by obstacles that affect the internal suppliers of these products. Talking with some industries that are buyers of this kind of fiber and Synthetic Yarns, one can see that the standard and most usual Polyester Product used in Brazil is a Polyester Yarn, described as “FDY 150D/48F LINEN DTEX NIM YARN”, not died, non-textured, untwisted (0% of Twist), followed by raw polyester fibers and polyester yarns with elastane. The Brazilian Association of Producers of Artificial and Synthetic Fibers (ABRAFAS) highlighted that Brazilian producers can only supply 40% of all synthetic fibre consumed by Brazilian textile industries, meaning that Brazil is importing around of 60% of the synthetic fibres and yarns that are consumed by its textile companies. Through information obtained by the Biz Latin Hub after making contact with some clients that purchase these synthetic fibres, the most commonly used yarn is a non-died, non-textured and untwisted fibre known as “FDY 150D/48F LINEN DTEX NIM YARN”. The other most important fibres are made of raw polyester and polyester mixed with elastane. ABRAFAS explains that Brazilian producers only are able to supply 40% of syntamerhetic fibre that is consumed by Brazilian textile industries. Logically, this means that a remarkable 60% of resources (valued at roughly US$2.5 billion per year) required by the industry is imported, suggesting operations to reduce the bureaucracy, modernise production and improve distribution services that hinder this market could be hugely profitable. Many foreign companies have already identified this opportunity and are working alongside local groups who can help support their commercial plans in the region. There is currently just one Brazilian company in São Paulo, in the city called ‘Americana’, and it consumes more than 300,000 kg of polyester yarn per month. It imports half of this polyester yarn from Indonesia and AA international Companies (with their headquarters based in Kuala Lumpur) and buys the other 50% from Brazilian companies. One of the owners of this company explained that although the prices can be more economical, the importation process can be very stressful and time-consuming, normally requiring the assistance of a local legal team. Foreign companies often encounter problems in finding good local suppliers, exchanging contracts and warranties, acquiring special licenses and adhering to the local importation requirements. For this reason, they often choose to work with a local partner to mitigate the complexity. As we can see, Brazil is a great and unexplored market, with a strategic, logistic and established regulatory system that allows collaboration with other Latin America countries. Additionally, private companies are able to enjoy all the opportunities that Mercosur brings to foreign companies who operate in the region. Through the incorporation of a local company in Brazil, one can legally engage in domestic production, or simply import these products and then resell them. 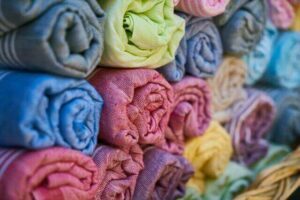 If you ensure your Brazilian company has high-quality products and a competitive price, even with your industry and production settled abroad, then is clear that there are ample investment opportunities in the Brazilian polyester market. If you want to know more about how to navigate the potentially complicated Brazilian textile industry, or if you simply want to understand the Brazilian business environment, reach out to Brazil Country Manager, Bruno, at [email protected].